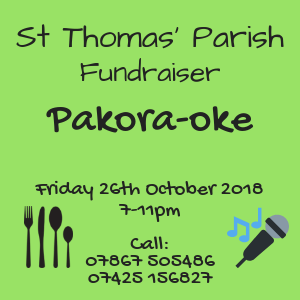 Join Andrena on Friday 26th October for pakora and karaoke! The fundraising committee have an evening of food, fun (and flops!?). Join us on Friday 26th October from 7pm until 11pm in the Hall for Pakora-oke. For tickets, call N. O’Donnell on 07867 505486 or A. Urquhart on 07425 156827.